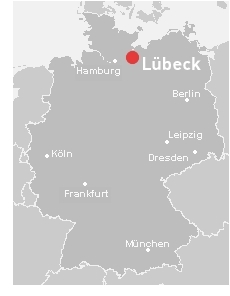 The city of Luebeck was formed along the Rivers Trave and Wakenitz around the year 1143, inheriting its name from a former Wend trading village called 'Liubice.' After a devastating fire, the saxon king Henry the Lion, established and rebuilt Luebeck for a second time. From 1159 Luebeck became a pulsating center of trade rivaled only by its counterpart, Venice. 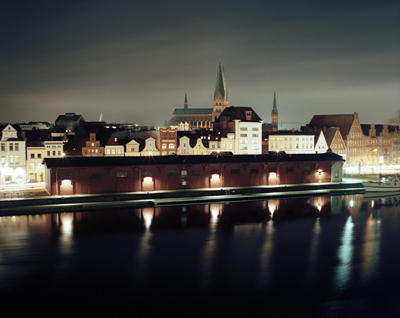 At breathtaking speed, Luebeck became the most powerful economic center of Northern Europe. In 1173, Henry the Lion laid the cornerstone of the largest brick structure of the North, the Cathedral (Dom zu Luebeck) and in the same year, oversaw the construction of the churches St. Mary and St. Peter (Marienkirche und Petrikirche). Under his reign, the currently existing layout of the old city (Altstadt) of Luebeck was designed: whoever goes through the old city is truly walking on historic ground. At the end of the 13th century a powerful alliance of merchant cities, the Hanseatic League formed with Luebeck as head of the Hanseatic Council. Though 'Queen of the Hanseatic League,' Luebeck was never a war-like city. The latin phrase on the main Holsten Gate is written, "Concordia Domi Foris Pax": 'Harmony within, peace surrounding,' meant to describe the philosophy of the community and the undisrupted free trade which Luebeck enjoyed. Luebeck was the home of both Thomas and Heinrich Mann and over the centuries, figured prominently in the lives of many artists, musicians, and writers such as Edvard Munch, Dietrich Buxtehude, Emanuel Geibel and not to mention Nobel Prize winner, Guenter Grass. The politician and Nobel prize winner, Willy Brandt is known to have said "I always carry a bit of Luebeck with me wherever I go." Today, Luebeck has about 200,000 inhabitants, over 5,000 of which are university students. The old city, though partially destroyed during the war, is still an architectural museum of the middle ages, and has just been elected "UNESCO World Heritage Site".